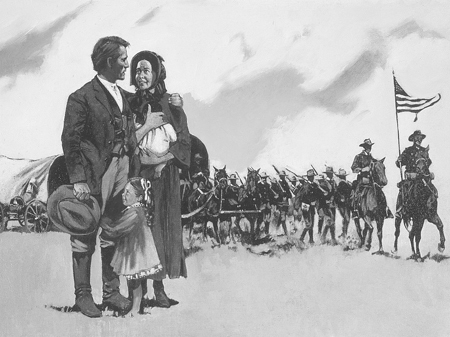 When the Mormon Battalion returned home to the Salt Lake Valley, it is said that the men of the Battalion were most destitute of what? From the life of Lewis Mousley: On this mission he labored in England, Germany, Switzerland, and Bohemia. While doing missionary work in Bohemia, he had an unusual experience. A Catholic priest, who had joined the Church, told Bro. Cannon a plan he had whereby they might preach the gospel to many people who otherwise might never hear of it. His plan was that they should fit themselves out with tinker’s utensils and go among the people mending tin ware, etc. While they were mending, they were incidentally to preach the gospel. The plan was carried out for some time and many people were baptized. The police, however, who were very vigilant, discovered what they were doing, and the brethren were forced to give up their plan. Andrew Jenson, L.D.S Biographical Encyclopedia (Salt Lake City: Publishers Press, 1901) Vol. 1, 687-688.